"Where is the giant pit that all those alleged human remains were dug out of in constructing Sobibor's "ash mountain / huge pile of human remians?" "It was made with soil collected from above the ground, which included human ashes and bone fragments"
LOL!!!! So what he / Yoram are saying is - huge piles of human remains were found, collected, piled into a giant mound, yet not one single photo of this was taken. Not one single report was made. All the evidence that was above the level ground was collected, but the evidence that was below the level of the ground was not collected. And everyone simply forgot about this incredible discovery for 35 years until Kola "discovered" the "huge mass graves." There's never a dull moment when dealing with the dull one! These guys should just do what the Germans did in the Katyn case. After the mass grave of some 4,500 Polish officers was discovered. There was a forensic investigation there. The Germans invited diplomats, journalists and scientists of neutral countries and presented a mountain of evidence. A mountain of material evidence as well as a hell lot of photos. A detailed report. Serious scientific work. Victims were identified and then were given a religious burial. When you realize that the Holocaust is a LIE, then all of a sudden, ALL your questions, ALL bizarre and strange things, disappear, and ALL things make sense, at last. KostasL wrote: These guys should just do what the Germans did in the Katyn case. I guess they would, except "these guys" lack the one thing that the Germans had at the Katyn site. Wir brauchen eine Bewegung, die Deutschland endlich aus der Kontrolle der Kräfte von Versailles und Jalta befreit, die uns schon ein ganzes Jahrhundert lang von einer Kastastrophe in die andere stürzt. Yes MrNobody - NO EVIDENCE AT ALL. And not just one single pit, they have yet to prove the existence of one single grave, one single body, one single pound of crushed bone or even so much as one single tooth. I saw a documentary in History Channel. It was about how scientists excavated a mass grave from Napoleonic period in Riga. Their question was whether Napoleon's soldiers retreating after disastrous Russian campaign, died of typhus or famine. They were able to find out that they died of famine !!! They just examined mass graves in a scientific way. And they answered their questions in an absolute way as all the evidence they needed were in the mass grave. And i remind that Napoleon's Russian campaign was in 1812 !!! And i also remind that scientists can answer much older questions than that. 1812 was a piece of cake for them, after they located this mass grave. KostasL wrote: And they answered their questions in an absolute way as all the evidence they needed were in the mass grave. Yes, forensical-archaelogical techniques available today are fantastic. Another example is the so-called Wolf's cave in Finland. Many many thousands of years old and still they could find out a lot about the fireplace once located inside the cave. Btw, if Kola don't get the money he need for the publication of his Sobibor results why don't he just put them up online. He's a tenured professor (as far as I know) so he shouldn't need the theoretical extra income that desperately. Or he could ask USHMM for the necessary bucks. This is just more obfuscation and deflection by the judeo-supremacist 'holocaust' Industry. They extort billions to do whatever they want and yet we're told that Kola can't get the money to publish his 'study', absolutely hilarious. The shysters know they will be further exposed for what they are if this 'study' pops up it's little lying head one more time. It's utterly indicative of fraud. Kola has nothing, Revisionists have shown that to be the case at this forum and elsewhere, and the fall back position is 'Kola can't find money to publish his work'. Incredible. Of course I have no idea if the pathological liar is telling the truth or not, but Muehlnekamp is claiming that he's got plans to go to Sobibor to - "collect and photograph bone fragments lying above ground." "As we're at it, I might be there [Sobibor] in mid-October. If so, how about joining me (at your own expense, of course)? Excavation of the mass grave areas will not take place before next spring, but we might collect and photograph bone fragments lying above ground." Well, I'm sure we can discuss all those questions at a later date, but what I really need from you - ASAP - is the date(s) of this photographic expedition so as to promote it to as many interested parties as possible. I'm sure you will be more than willing to help me out with this information / promotion because this is such a great opportunity for you to put an end to holocaust denial, wouldn't you agree Yoram? And the opportunity to show the world how much work you have done on-site, i.e. the progress made with your excavations to date would be priceless, don't you think? Thank you in advance for answering as many of the above questions as you have time for and thank you very much for an answer as per the date(s) I've inquired about. We'll see what kind of a response I get from Yoram or RM. 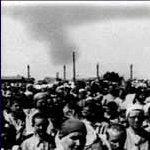 Where / who are all the Poles in the holocaust truth movement? Wouldn't this be a great time / place for them to make their presence felt? Also, what about The World Holocaust Foundation? (Tehran conference) Wouldn't something like this be a great opportunity for them to get involved with? Greg Gerdes wrote: Muehlnekamp is claiming that he's got plans to go to Sobibor to - "collect and photograph bone fragments lying above ground." Greg, if I subject some Crushed Beef Bones to high temperatures over/in a fire, spread it out on a grassy area, take photos & claim it was from Sobibor........will you give me the Hundred Grand? I really could use it! I got the evidence photo first. The hundred grand is mine. See also this huge evidence from Treblinka. KostasL wrote: See also this huge evidence from Treblinka. That must be one of the excavators used to disinter the buried corpses. Haven't any of you watched The Flintstones? Ha! Would you like that in small bills? Isn't it funny, if a few bits of bone fragments are supposed to be evidence of mass murder, then there are about - oh, a trillion piles of such evidence for mass murder spread around the state of Montana. Gee, who woulda-thunk-it that one could find some bones in the woods? The fact is, not so much as one single bone fragment proven to be human has ever been located / proven to exist at Sobibor. Not one single grave has been located that contains a single body or even an ounce of human bone, an ounce of human ash, or even so much as a single human tooth. NOT ONE! FYI - The only human bones (which were known to the jews to be from a non jew), that were ever to be seen at Sobibor (in the glass display case), have disappeared! They are now, most likely, under the anti-investigation cap put over the "huge mountain of human remains" so frauds like Yoram can say with a straight face that the "ash" mountain "contains" human remains. Not - comprised of, but "contains." 65 years since the alleged mass murder of 250,000 jews. Two separate "discoveries" (one put down the memory hole - why?) of the alleged "huge mass graves." The construction (and subsequent refurbishing) of a "huge mountain of human remains." An archeological "investigation" conducted by the fraud Kola. An ongoing (8 year) archeological "project" conducted by the fraud Yoram Haimi. A $100,000.00 reward for locating / proving the existence of just 1/10th of 1% of the bone fragments or teeth of the alleged murder victims. Not an iota of human remains has EVER been proven to have been located / proven to exist at the Sobibor site. Maybe 65 years just isn't enough time? Maybe 8 years just isn’t enough time? Maybe $100,000.00 just isn't enough of an incentive? Maybe the jews just don't want to put an end to holocaust denial? I have found out on my own that you have invited Roberto Muehlenkamp to Sobibor for some type of archeological expedition for the dates of Oct 14 -16. Could you confirm this information for me? "I’ve been invited by Yoram Haimi, director of the SAP... I will be there [Sobibor] from 14 October to 16 October." Is the above true? And if so, who else has been invited? Why not an open invitation to the entire world to come see your archeological work / progress to date? Why the limited access? Why would you invite a proven psychotic, pathological liar and no real archeologists or historians? Why no invitations to other interested parties and impartial observers? Don't you want to show the world all the "work" you've accomplished in the last 8 years? Don't you want to help put an end to holocaust denial? How does it feel having a magnifying glass put on you and your fraudulent "project?" How does it feel to know that the whole world now knows that you haven't so much as turned one single spade of dirt in the last 8 years? How does it feel knowing that you and your "project" have been exposed as the frauds that you are? You can run Yoram, but you can't hide. No wonder Muehlenkamp is the only one who has been invited to this exploration / expedition. Some really good advice. What about a independent historian's commission like they did in the case of Dresden (except that this historians commissions wasn't really independent, and that Dresden had pretty much of construction activity going on in the mean time, making it actually impossible to assess to the full extent). The extermination camps so-called are outside city centers, should be relatively easy to do some forensic work on this.